A collection of MIT licensed general purpose utilities for use with Unity. Right now this consists of mostly editor controls and helper classes but more will be added. Contributions and feedback are welcome. These attributes are added to serializable fields in editable classes (MonoBehaviours or ScriptableObjects) to enable custom drawing for the field. All attributes are in the PiRhoSoft.UtilityEngine namespace. Add this to an int field to show a popup instead of the default text box. 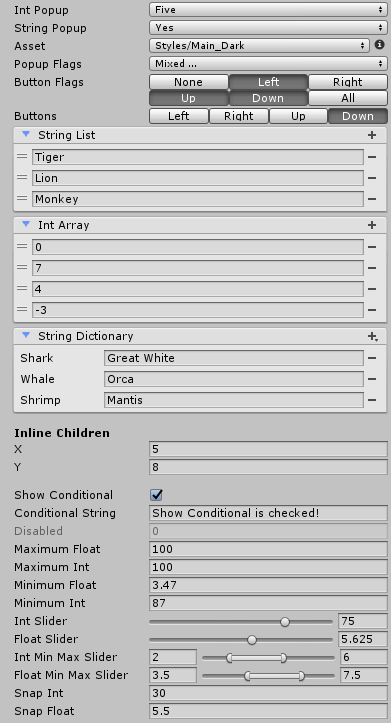 The constructor takes two parameters: an array of ints that are the values to select, and an array of strings that are shown as the label for each value. Add this to a string field to show a popup instead of the default text box. The constructor taken one parameter: the list of strings to show and select from in the popup. Add this to a ScriptableObject or ScriptableObject derived field to show a popup listing the available assets of the correct type instead of the default asset picker. This will list assets based on their structure in the project folder so for some things it can be easier to find them with this rather than the default asset picker which instead provides a search function. Add this to an enum field to show Unity’s EnumFlagsField (which lets you select multiple values) instead of the default enum popup (which only lets you select one value). Add this to an enum field to show a series of buttons for selecting the enum value rather than the default popup. If the enum type has the Flags attribute, the buttons will be toggleable and support multiple selections. Optionally set the MinimumWidth property (the default is 40) on the attribute to specify the smallest each button will be displayed, potentially making the field wrap to more lines in the inspector. Add this to a SerializedList or SerializedArray derived type to show a much more user friendly list editor than Unity’s default. The implementation is based on Unity’s undocumented ReorderableList class with lots of improvements. Further customization is possible by directly using the ListControl (or one of it’s subclasses) in a custom Editor or ObjectControl. Add this to a SerializedDictionary derived type to show a dictionary editor (by default dictionary editing is unsupported by Unity). This uses the same internals as ListDisplay. Like ListDisplay, further customization can be made by using DictionaryControl from a custom Editor or ObjectControl. Add this to a class or struct type with a Serializable attribute to show the fields of the class or struct inline rather than in a foldout. Optionally set the PropagateLabel field on the attribute (the default is false) to specify the label of the owning field should be used rather than the label for each of the fields in the class or struct. This can be useful for wrapper classes that contain a single field. Add this to any field to hide the field in the inspector unless a different field is holding a specified value. Set the property name in the attribute constructor as well as the dependent value using named arguments. The dependent property can be a string, enum, int, float, bool, or Object. If it is an Object, the field is displayed based on whether the Object is null or not. If HasReference is true (the default) the field will be displayed when the property value is not null, If HasReference is false the field will be displayed when the property value is null. Unfortunately, when using this attribute only the default editor for the field will be used. If the field type has a custom PropertyDrawer it will be ignored due to the way Unity internally resolves property drawers. Add this to any field to disable editing of the field (while still showing it) in the inspector. Add this to an int or float field to disallow selecting of a value higher than a specified value. Set the maximum value in the attribute constructor. Add this to an int or float field to disallow selecting of a value lower than a specified value. Set the minimum value in the attribute constructor. Add this to an int or float field to show a slider instead of the default text box. Set the minimum, maximum, and snap values in the attribute constructor. Add this to an int or float field to show a two value slider instead of the default text box. Set the minimum, maximum, and snap values in the attribute constructor. This attribute actually edits two fields - the one this is added to and the next field in the class. This should be added to the field that holds the beginning of the selected range with it’s sibling holding the end. The sibling field should then be given a HideInInspector attribute to keep it from showing up. Add this to an int or float field to round the selected value to be a multiple of a specified value. Set the snap value in the attribute constructor. This can be used just like the built in List class but because it isn’t the built in List class can be targeted by PropertyDrawers. Because Unity doesn’t serialize generic classes, though, it is necessary to subclass this for each type and give the subclass the Serializable attribute. This is exactly like SerializedList except for Arrays. The exception is SerializedArray must be constructed with a length.